Two leading plastic surgeons joined AMAR’s medical team in Iraq to review and plan follow-up treatment for some of the country’s most severely injured victims of recent conflict. Dr. Graham Smith, a facial reconstruction specialist, and Dr. David Gateley, an expert in hand surgery, examined several patients including Shams, a young girl who was terribly injured by a car bomb attack in Baghdad’s Sadr City a decade ago. The blast, which left Shams blind and facially disfigured, also killed her mother. The little girl has been receiving treatment and further help from AMAR ever since. Doctors Smith and Gateley also met Asraa, a fellow medic whose face was damaged by a bullet wound, as well as other urgent cases being treated by local plastic surgeons. During a visit to the Al-Sadr Teaching Hospital in Basra, they also helped with the training of local doctors and assessed equipment and facilities. Dr. Ali Muthanna, AMAR’s Regional Manager in Iraq, was delighted at the success of the surgeons’ visit. He added that bringing surgeons like Dr. Smith and Dr. Gateley to treat wounded Iraqis and to update Iraqi surgeons on the latest medical knowledge is more cost effective than bringing victims of Iraq’s conflict to the U.K or U.S. It also avoids the difficulties of visa restrictions and of traveling while injured. During their visit, the doctors met some of Basra’s leading plastic and maxillofacial surgeons as well as Dr. Riyadh Abdul Ameer, the city’s Health Director General. They spoke, at a lecture hosted by AMAR, to a group of surgeons, senior house officers and visitors about their decades of experience and the latest methods, technologies and procedures in plastic surgery. “The trip was a huge success. It enabled us to assess patients in need and to establish the quality of the facilities available in Basra. The local team of doctors and nurses were incredibly welcoming and they did an amazing job of primary reconstruction on Shams and Asraa,” said Dr. Smith. 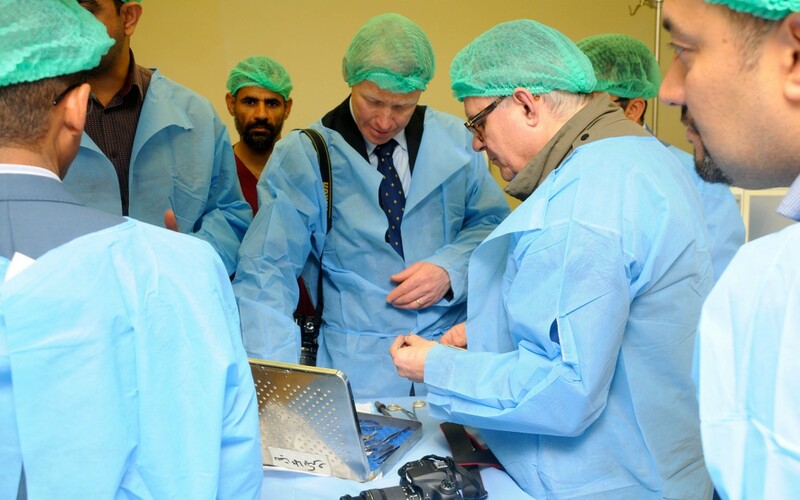 During their trip they also observed the hospital’s surgical center to get a better idea of the conditions that Basra’s surgeons are operating in. “They are working in incredibly difficult conditions. They have to work through frequent power cuts and without access to high quality modern optics. Surgically that is a big challenge,” Dr. Smith added.